Once you enter the gates to the Alberta Temple or the Church of Latter Day Saints in Cardston, Southern Alberta, the first vision is of the amazing architecture of the front entrance. The gates, grounds and building are just a small taste of the elegance that this temple has to offer where people come to partake in their religious beliefs. Entrance to the Alberta Temple, Church of Jesus Christ Latter Day Saints, in Cardston, Southern Alberta, Alberta, Canada. 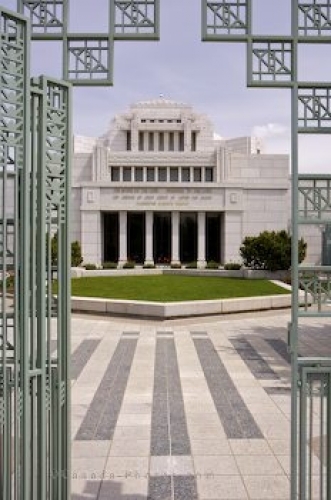 Picture of the open gates to the Alberta Temple and the main entrance in Southern Alberta, Canada.